The 2019 Jeep Grand Cherokee has a 7,200 pounds towing capacity and additional features to make towing a breeze. Drivers in need of a capable SUV with excellent towing specs will find what they are looking for in 2019 Jeep Grand Cherokee. Explore all four of the Grand Cherokee engines, and their towing capacity, below. When you’re ready to schedule a test drive, contact our Jeep dealership in Arlington to view Jeep offers today. Trailer Sway Control: Reduce trailer sway and get better handling in even the most challenging Duncanville towing conditions. This feature applies brake pressure on alternating wheels adjusts engine throttle to help maintain vehicle stability. Hill Descent Control: This system automatically applies the brakes if the Jeep Grand Cherokee system detects a steep incline. This can allow you to safely drive down a hill, even if you are towing a heavy load behind you. Hill Start Assist: This feature prevents roll back when parked on a incline by holding the brakes between when you shift from brake pedal to accelerator. High-performance Brembo brake Systems: High-performance brakes, available on the Jeep Grand Cherokee Trackhawk and SRT®, can provide peace of mind when hauling heavy loads. 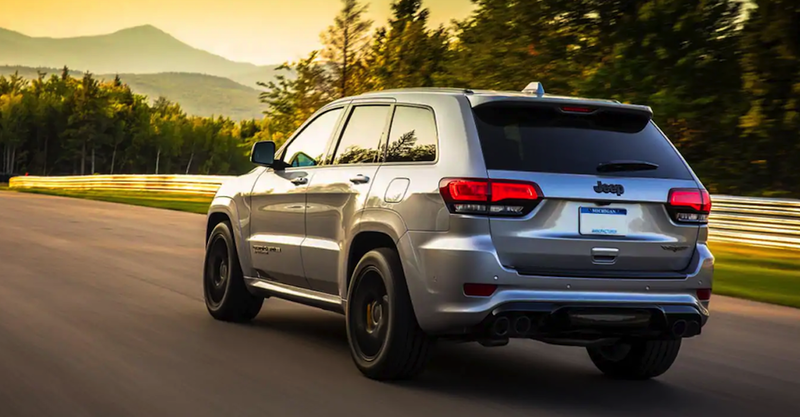 These strong brakes feature two-piece vented rotors and six-piston front Brembo calipers on the Trailhawk and 15-inch front rotors and six-piston calipers on the SRT®. Tour the Jeep Grand Cherokee interior featuring UConnect®, and you will find an interior as powerful as it’s towing capabilities. Explore the new Jeep Grand Cherokee models available at Classic Chrysler Jeep Dodge RAM FIAT to get the performance and features you want and see how it stacks up against the Dodge Durango. Stop by Classic Chrysler Jeep Dodge RAM FIAT for a test drive today!